Here is a series of frequently asked questions that Ms Possum receives on a regular basis. We’re sharing with you the hissily sarcastic answers Ms Possum is tempted to give and then the politically correct answers which we actually provide. Q: How do you shear a possum to get the fur for your knitted garments ? WRONG ANSWER: We have specially designed salons in which the Possums sit down with a cuppa tea and the latest gossip mags. We gently clip them with the trendiest of style, finishing off with a delicate blow wave and if necessary, straightening irons for those stubborn curls. We even throw in a free manicure to boot. Then we make appointments for six weeks later when the fur has grown again and we need to repeat the same process. RIGHT ANSWER: They’re not like sheep, dahlings! They, ahem, have to be mercifully despatched first and then hand plucked while still warm. Forget about those plucking machines too – it’s far too rough a process for our liking. Q: Do the possums come from the wild in those bright colours? WRONG ANSWER 1: Yes, we put food colouring in their feed to turn their coats into bright red, flouro pink and even lime green! We just go through heaps of cochineal and jelly crystals! WRONG ANSWER 2: Yes, they are the result of genetic modification. RIGHT ANSWER: Possum New Zealand dyes the Possum hides in 17 different colours from their natural state. Q: We’ve got a possum trapped up in the ceiling. What can you do about it? WRONG ANSWER: Well, you’ve obviously called the right company. We’ll just send our senior stylist down and while it’s not in her job description, she can catch it for you in her high heels and for a little extra, convert it into a fashion scarf. Yep, it’s a one-stop-shop here. RIGHT ANSWER: Try Pest Control. Q: We’ve just run over a possum. Do you want it? WRONG ANSWER: Yeah, we want it like a hole in the head. We’ll scrape it off the road for you, then gut and de-flesh it as the pet dog would love a menu change. Our landlords would also love us to death for causing a sanguinary mess within a CBD building as our Body Corporate rules specifically preclude us from using the premises as an abattoir. We’ll then dry the hide out and make it into something fit for a horror movie. Yeah, why wouldn’t we want it?! RIGHT ANSWER: There’s actually about 47 stages of processing between capture and when Possum NZ gets the tanned, dressed and dyed hides. That’s why we have to go through our Tannery to obtain the best luxury quality hides. But thanks all the same. Q: What do you have in the way of steel radials? WRONG ANSWER: Obviously you cannot read a phone book. What have we got to do with the automotive industry? RIGHT ANSWER: You probably want Possum Bourne, the company named after the famous NZ Rally car driver. If you look in the New Zealand phone book, he’s the listing above Possum New Zealand. Q: How much to send a parcel to Christchurch? WRONG ANSWER: Obviously you can’t read a phone book either. Are we all blind today? RIGHT ANSWER: You have punched in the wrong last digit of New Zealand Post’s 0800 number and got Possum NZ instead (0800NZPOSSUM). Please refer to the phone book. Q: I am Rev Elisha Godwin from Nigeria (names change with each identical query). We are setting up orphanages in our country and want to order your possum rugs and cushions. Can we pay by VISA over the phone and we’ll get the goods picked up direct from your factory by our own shippers? WRONG ANSWER: Yeah, like we were born yesterday. How absolutely generous of you to treat these poor orphans with such high ticket products that only the well-to-do can afford in western countries. We know they’ll just appreciate the thermal qualities of our possum throws in the 40-degree heat of Africa. And of course you can pay thousands of dollars on a stolen credit card over the phone because we just love losing money during a Recession and yes, we’re that stupid here in New Zealand that we’ll fall for any hard luck story. Although if you truly are a Reverend, doesn’t the Bible say: “Thou shalt not steal”! RIGHT ANSWER: Sorry, our banks have advised us not to deal with Nigeria. Q: We are a company from China – can you supply a container load of possum skins each week for our fur factories? WRONG ANSWER: You’re having me on, right? Wish I could do that as I’d be a rich woman!! RIGHT ANSWER: Sorry, New Zealand is only a small country and the infrastructure does not allow anywhere near those quantities even if everyone combined their resources. We would rather sell you our value added goods made here in New Zealand for you to market as elitist, limited edition products back in China. Q: OK, you can’t supply container of possum skins to China every week – what about other animals? We’re not fussy – we just have to have a container load – any animals will do. WRONG ANSWER: Well I know the SPCA always has spare animals to give away and yeah sure, I could round up a few thousand stray cats and dogs in my spare time as well. RIGHT ANSWER: Sorry, we can’t help you here. As explained above, we suggest you purchase fully made-up possum fur items from us and resell in China for good prices due to limited raw material availability. If you have a possum query you’ve always wondered about, but were too scared to ask – just send me an email and if it’s within the “high calibre” range of the above, I could give a quick flick of my talon and have it posted before you can say “and a Possum in a Pear Tree” ( which is Ms Possum’s typical end of year greeting). Well possums, sometimes Ms Possum works a bit too hard in the relentless fight against pests, so it was time for a country sojurn over a long weekend to get bright eyed and bushy tailed again! So she was off to the outskirts of Blenheim, a sleepy town at the top of the South Island. The area is renowned for its endless hectares of vines which produce New Zealand’s world class Sauvignon Blanc, Pinot Noir and other amazing wine varieties. Ms Possum drinks nothing else during her nocturnal adventures in her hometown up North! And, not only is the wine to die for, the region also produces mouth-watering olive oil and honey – it’s a gourmand’s paradise! The bit of R&R gave me a chance to commune with animals other than those of my namesake. I must admit though, there were times when we ran over something lumpy on the road, and the evidence suggested that there were one or two less of my Possum friends for the Tannery; ugh! No, I wasn’t tempted to scrape the two-dimensional ex-life forms off the road – Ms Possum does have to maintain some semblance of dignity after all. Not only that, but I was on holiday! Fortunately, no reputation had preceded me, so I was able to go incognito and meet the animals who lived nearby and welcomed me to their paddocks with open hooves. This mini pony literally bounced over to say “Hi”. He wanted to know what I had in my pockets and loved the tall stems of lush green grass I had picked for him. He did try to tell me that the stalk part was not palatable – ok, so I’m a city girl! I horse whispered to him for ages and he told me he wanted an all over head massage, which of course, I obligingly gave him. Next it was to the big horse paddock. The two great big creatures were previously aloof, but mini pony must have put in a good word, because they soon stooped to give me some time of day. A bit of choice grass their way helped to break the ice between us. The two black and two white sheep next door proved that apartheid doesn’t exist in their neck of the woods. After baa-ing at me initially as an unwelcome interloper, they also succumbed to the succulent culinary items on offer. Thank goodness they didn’t know I produced baby lamb jackets! At the mud brick house bordering a vineyard where I was staying, was KoKo the Birman cat. He was delighted at Ms Possum’s visit and couldn’t resist disguising his legs with one of Possum New Zealand’s “Harlequin” striped possum fur scarves. 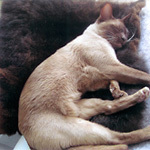 Yep, there is something about possum fur that sends cats into Seventh Heaven. 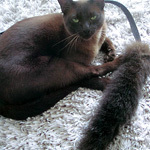 KoKo loves chasing his possum off-cut which is attached to a lead – keeps him amused for ages! Just as I was forgetting myself, I met a friend’s dog inadvertently named after me! Yep, “Possum” is super hyper, super friendly and finds it hard to sit still. Naturally, I felt an immediate affinity with this beautiful dog, and I thought possums of one kind or another are always popping into my life! Then it was on to visit another friend who lives in a beautiful three-acre estate, bordering a stream. Sipping tea in the sumptuously appointed living room, complete with possum fur throw, I spied a huge rifle nonchalantly placed against the burr walnut dresser near the front door. “It’s to shoot the starlings in the roof” I was told after I expressed surprise at this incongruous, non designer décor item. “But of course” I said, suspecting every Blenheim home had one. Obviously my host was a crack shot, because I didn’t notice one buckshot hole in the pristine ceiling! It was reassuring to know that someone else had to deal with pest problems, and suddenly Ms Possum felt she was not entirely alone in her crusade to restore nature to its correct equilibrium. Back on the road, I encountered other creatures such as herds of Friesian cows’ dotted (excuse the pun) in amongst the vineyards. As we didn’t get a chance to stop to take another pic, my hosts kindly obliged me with a “mock moo-moo” in my quarters (excuse the alliteration). So there you have it, Ms Possum goes rural, meets other critters and broadens her outlook on the animal kingdom. It was a lovely weekend meeting creatures great and small. Now it’s back to the animal Ms Possum knows best, as she prepares to keep the Northern Hemisphere “warm as a bug in a rug” for the coming winter. It was a dark and stormy night, one that makes you want to slip deep down under the bed covers and ignore those “bumps in the night.” Ma was sleeping peacefuly when she was awoken by an insistent tugging at her toes. She automatically knew it was not the amorous advances on the part of her other half as they had been married far too long for that sort of nonsense. As her eyes adjusted to the dim light, there appeared what seemed to be an alien gremlin with devious intentions. In fact, it turned out to be a base jumping possum, that had gained access via the chimney – a furry fiend all the same! Turning to Pa with the shriek “there’s a possum on my bed,” heralded the unhelpful reply “go back to sleep woman!” The defender and protector of the family may have snored his way through the home invasion, but in doing so he paved the way for an unsung hero to save the day. As Ma shooed the googled eyed critter off the bed and out the bedroom door, little black pellets were scattered about the room and squashed into the carpet. Ma’s eyes narrowed. This was no longer about saving the flora and fauna of our beloved country, this was now personal! The ensuing shrieks from Ma and skidding claws on lino aroused the protective passions of the family dog, Gertie. Dear Gertie who’d flee from a cat and delicately tread around puddles, leaped into action catching the invading creature in her narrow jaws. The offending animal was rendered helpless as fur flew in all directions. Us kids poured out of our bedrooms just in time to see Pa (who’d eventually decided his wife wasn’t hallucinating, and that it was now safe to intervene and take credit) remove the piqued possum to the outdoors. Thus our family was spared. Gertie was rewarded with pats and bikkies, though of course it wasn’t a happy ending for the possum. It just goes to prove that base jumping is an extreme sport – if you base jump down a chimney and carry out base acts, you’ll have to accept the consequences. We recently were sent a fab thank you card from two furry feline friends of Ms Possum and she wanted us to share it with you… looks like our possie products are just as popular with the smaller mammals as they are with the homo sapiens! Our names are Phoebe and Enzo. We love all things Possum and we want to say a big MIAOWW for our super possie mat, which matches our super possie tail… PURRFECTLY! (We are fussy about these things… colour coordination is sooo impurrrtant). If ever you want to drop by for a cuddle and a bit of attention, we would love to snuggle up to you in appreciation. The possie moggymat is a new design especially for the smaller furry family members and will be released to the website soon, so watch this space!